Tip Number One: When growing vegetables, make sure you plant ones you like. A lot. I planted a small veggie garden this year, and husband and I have been enjoying the fruits of our labor (he built the raised bed) for many weeks now. I have discovered there are some vegetables I like… but maybe not a summer crop’s worth. On the yes side: tomatoes, especially grape tomatoes. We’ve been picking enough for nightly salad (and more) and marveling at how these fruits/veggies actually taste like something! On the not-so-much side: squash. Yes, I like yellow squash. And I’ve got a great recipe (thanks, Ina Garten cookbook) for butternut squash that’s easy-peasy and delish (my variation below). But after a while, it’s hard to think of things to do with these vegetables. They’re not wasted, though. They go to neighbors and husband’s office workers. 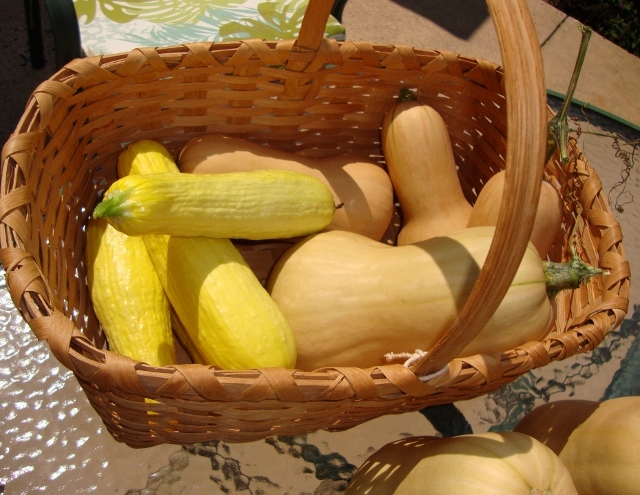 Next year: one, just one, squash plant each. Peel and dice one butternut squash, and spread on baking sheet (lined with parchment paper is good). Peel cloves of an entire head of garlic (this is where I digress from Ina – she says to leave the garlic as is) and put among squash pieces. Sprinkle with salt and pepper and olive oil and…TWO TABLESPOONS of maple syrup. Real maple syrup. Roast in 350 oven until squash is soft (about a half hour) and pancetta is crispy. Cinnamon and nutmeg to taste (about a teaspoon of the former, dash of the latter is good for me). Either cut the butter into the mixed dry ingredients or melt the butter and mix it all together. I’ve done it both ways and it doesn’t seem to matter. Place cookie-like dollops on a parchment-paper-lined baking sheet. Bake at 350 until it’s done. Hey – you expect me to remember the timing? All I remember was it didn’t take long. Tip Number Three: A garden next to your patio or deck can be a fragrant as well as visual delight. Around our patio, we have the usual assortment of colorful flowers–feathery astilbe for early summer, coneflowers later in the season, drought-resistant Sedum opening late August into early fall, along with vibrant mums. 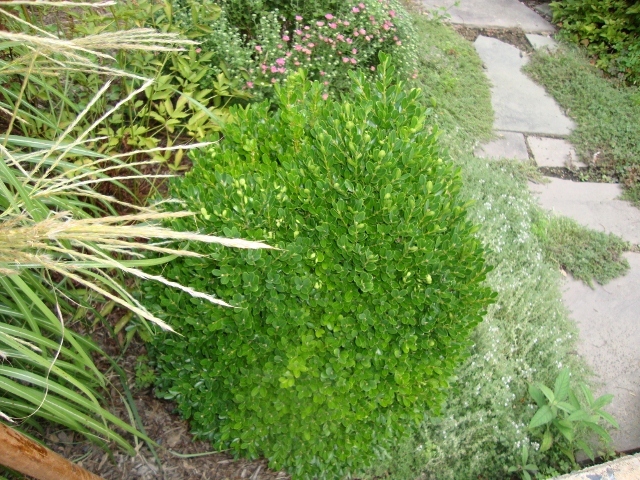 But we also have some boxwood shrubs and ground-cover thyme along a short flagstone path. Every time you step on the thyme, it releases a soothing tea-like aroma. And the occasional breeze wafts the musky odor of boxwoods to us, a memory trigger if ever there was one. For me, it’s a mental trip back to the gardens of Fontainebleau, where I spent a summer, or walks around Williamsburg, where my son went to college. For my husband, it’s a journey back to childhood where a neighbor had a hedge of the shrubs. Don’t forgo boxwood because it takes so long to get a hedge of them going. Their scent is just as wonderful as the privacy they can provide.